Ukraine's Verkhovna Rada has passed at first reading bill No. 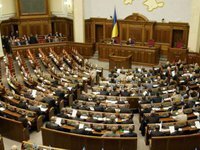 9260 from the budget package with amendments to the Tax Code of Ukraine and some legal acts on the increase of the excise duty on tobacco products and some other excise duties, environment tax and cutting the limit for duty free parcels for individuals. A total of 233 lawmakers backed the document, an Interfax-Ukraine correspondent has reported. "We propose to increase the number of excise duties on tobacco products by 9%, raise the environmental tax and extend it by five years, as well as raise a number of other rates," acting Finance Minister Oksana Markarova said, presenting the bill in parliament on Thursday. Parliament Speaker Andriy Parubiy thrice put the bill to the vote. At the same time, no votes were cast for consideration of the bill under the fast-track procedure. As the Ministry of Finance said on its website, the bill provides for an increase in excise duty rates on tobacco products by 9% from July 1, 2019 (projected inflation in 2018), royalties for special use of forest resources by 50%. It is also proposed to increase the royalty for the use of subsoil for the extraction of oil and condensate by 2 percentage points, for the extraction of iron ore - by 0.8 percentage points. "In order to stimulate polluters to reduce environmental pollution, as well as to approach the rates for greenhouse gas emissions in EU countries, we propose to increase the environmental tax rate for carbon dioxide (CO2) emissions by stationary facilities from January 1, 2019 from UAH 0.41 to UAH 10 per tonne and to provide for a gradual increase in the rate to UAH 30 per tonne in 2023 (an annual increase of UAH 5 per tonne)," the Finance Ministry said. The ministry said that in order to increase oversight over the fuel turnover, it is proposed to reflect in the electronic fuel sales administration system the actual movement of fuel in the context of storage locations (currently, accounting is done in the context of business entities). It is also planned to carry out a comparison of the indicators of the system and indicators of flow meters and fuel level meters in the tanks in terms of turnover and fuel ending stocks in the context of Ukrainian tariff heading, excise warehouses and managers of excise warehouses. Another measure to count fuel is the introduction of licensing activities of all business entities engaged in the production, storage, wholesale and retail trade in fuel, as well as the introduction of control over the intended use of aviation fuel with setting a 10-fold factor for the use of such goods for other purposes. It is also proposed to set a zero rate of excise tax on ethyl alcohol used for the production of edible vinegar, perfume and cosmetic products and technical products, but introduce separate accounting for movement of alcohol in the sales administration system and oblige consumers of preferential alcohol to install flow meters of alcohol produced and manufactured products with daily data transmission to the State Fiscal Service. According to the bill, the requirements on changes in the administration of fuel and alcohol excise tax will come into force on July 1, 2019, and the responsibility for the violation of these standards - on October 1, 2019. In addition, the bill provides for the reduction of the limit for importing goods into the customs territory of Ukraine in one dispatch from one consignor in international mail (or in one cargo of express carrier from one consignor in international express shipments) from January 1, 2019 from EUR 200 to EUR 150, and from June 30, 2019 - to EUR 100.